Open to horn players who enjoy making music within an informal friendly group which offers the opportunity, for a very modest fee, to meet like-minded enthusiastic hornists, either as a paid-up subscriber or as an occasional visitor. The Club, supported by its committee, offers a rare opportunity for members to experience playing music of different styles, written or arranged in multiple parts for horns. Occasionally the group presents music to the public. Meetings are held at different venues in an effort to accommodate and simplify travelling for members. The commitment of the organisers is already in place therefore the success and future of the NHC depends on the dedication and commitment of members to attend regularly. The Club has an extensive library of music and therefore offers an unmissable opportunity to take advantage of a unique and wonderful resource. 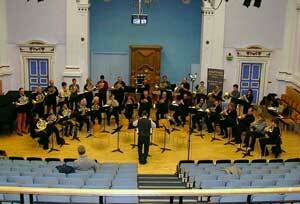 A Multipilcity of Horns - Leeds University February 2014.